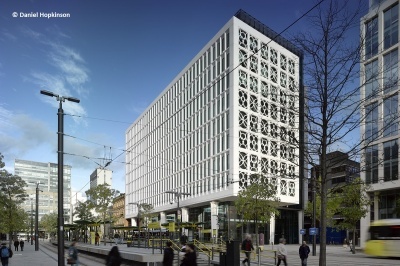 Two St. Peter’s Square is a new build, Grade A office space in the heart of Manchester city centre. It faces the Grade I listed Town Hall and Grade II listed Central Library. The building is 12 storeys above ground with a two-storey basement. The key driver for the structural design has been to provide highly flexible column-free accommodation that is attractive to potential tenants. The typical beams are 730mm deep and, over the 18m span, vibration was a key criterion governing many of the section sizes. At ground level the architectural intent was to provide a colonnade with columns at 12m centres and cantilevers of 6m at either end. Continuing this wide spaced grid on the typical floors above was not economical so a transfer structure at the lower level was utilised. To maximise the spatial experience of the colonnade at ground floor level the columns are double-height with the first-floor floorplate set-back from the perimeter. Long-span transfer beams at level 2 achieve this with the first floor hung from above. A similar arrangement is adopted at level 10 with transfer beams that support the set-back columns above. This arrangement provides a high value terrace space overlooking the civic heart of Manchester whilst also responding to the planners’ concerns on massing. Vertical access for the building, both for people and services, is via the core. Positioned offset on the building floor plan this maximises the available floor area and the length of premium elevations facing the square. Building stability is provided by the reinforced concrete core which acts as a cantilever from the raft foundation at basement level under the lateral loading imposed on it. Supporting the façade presented several engineering challenges. Each unit was constructed in 6m wide by 4m high mega-panels. The extent of movement of the frame under the significant façade loading was meticulously calculated during the different phases of the build. This involved pre-setting the steel frame, so it could settle incrementally as the mega-panels were installed. Long-span beams form the typical floors giving column-free flexible spaces. Economy was achieved by integrating the structural and service zones, utilising composite action between the steel beams and concrete slabs and adopting asymmetric sections. 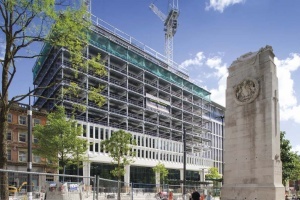 Two St. Peters Square has regenerated a prime site in central Manchester providing a positive contribution to the city and enhancing the adjacent public realm. This scheme of new Grade A offices in the heart of Manchester’s civic centre responds to the challenge of this site of prime importance. Not only does the glazed stone tracery respond appropriately to the location, but the elegant steel-framed building with 18m clear spans provides flexible accommodation highly attractive to tenants.